Channel shift has been a hot topic in housing for a few years now and certainly for us IT vendors it has been a buzz phrase that we’ve all been riding on the back of for a while. Essentially channel shift is all about trying to get tenants online and reduce the number of times they contact call centres by phone and we’ve all worked very hard to get them on and using our portals and applications and encouraging them to do so by offering up a multitude of services from the web. In a world where housing associations are having to achieve more with less funding and less resources while continuing to provide better services to customers and increase the number of affordable homes being built we’re going to need to look at achieving what I call true channel shift. We really need to get the majority of customers away from using the call centre but also importantly move away from back office staff having to make countless decisions based on the information coming through from the various communication channels and systems in use. What I’m talking about is the next generation of efficiency savings for housing associations and pretty much shutting down those expensive to run call centres. 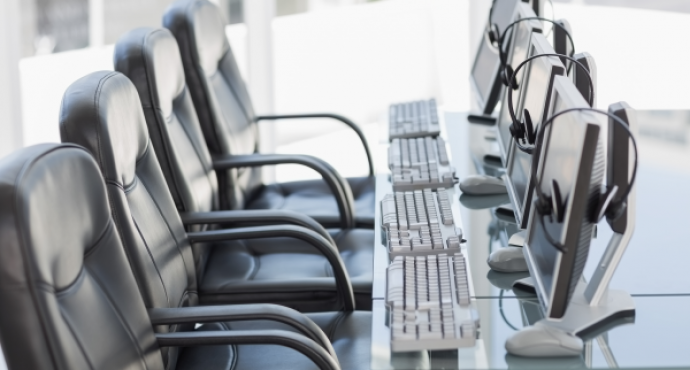 All of the technology to achieve what I call the “Empty Call Centre” is already available and could be adopted today. It may be too early for a truly comprehensive service without the need for human involvement but the next few years will provide us with the advances in conversational interfaces and artificial intelligence (AI) to really make this work. It’s safe to say that a lot of people are also going to have to get their heads around this concept over the coming years just like they did with the cloud (who remembers everyone objecting to the cloud a few short years ago?). So lets trail this concept of an empty call centre and work through a quick case study of a housing customer an issue with their central heating system. Instead of waiting for the customer to log a problem online via your tenant portal we can deploy smart devices into their homes to be much more proactive with alerting us when an issue is either happening or going to happen. We can also deploy environmental monitoring solutions to check on the temperature, humidity, carbon dioxide and monoxide levels, even movement if we wish (I am well aware that we’re stepping into some potentially dodgy areas here with regards to monitoring of peoples movements and certainly explicit consent will be key). Now if we take this technology and use AI to start making sense of the information that these smart sensors and devices are sending to us then we can begin to not only remove the need for humans to be involved in the decision making process but we can also be much more proactive with our service. So back to the example of a customers with issues with their heating. Let’s presume we have deployed a smart boiler to this property and it is triggering an alert that it has an error code. This data alone doesn’t really enable a computer to make a decision about what to do. However if we add to that the fact that we’ve got environmental monitoring in place and we can see that even though the boiler is failing the temperature in the property is still within comfortable limits. The system can now begin to prioritise this potential repair job without a human involved. If we then add to that information feeds from the web with regards to forecasting of the external temperature over the coming days, data from our CRM or Housing Management System to gain some knowledge on the customer (perhaps their age) and then finally we add in historic data collected about this and other similar properties about how quickly they are likely to get cold in the forecasted conditions then we can enable our IT systems to make a priority judgement and decide to get someone out asap. We can then go a step further and keeping people out of the loop still, the system can then utilise information from our existing back office systems with regards to availability of operatives and currently planned in work, travel distances, availability of parts etc. We can even proactively make an appointment and book this in direct with the customer via a text or email. Actually if we’re really harnessing the power of conversational interfaces and natural language processing why don’t we get the computer system to give the customer a call or use their existing home device if they have one (perhaps Amazon Echo) and let them know in a conversational way that firstly there is an issue and secondly when someone will come out to repair the problem. As we’re utilising a true conversational interface here the customer can then discuss options with the system. Perhaps they aren’t going to be around when the appointment has been made and therefore they would prefer a later appointment. The system can then handle the re-planning and reappointing of the work and communicate to the operative where necessary. Now we’ve got true dynamic and automatic scheduling! This solution also can enable a complete shift away from traditional mobile apps for operatives. Instead we can let them communicate conversationally with all the relevant back office systems to ask where their next job is, what parts they may need to take and where to pick them up from on the way. With a solution like this we can completely remove the need for customer apps and portals, do away with mobile field worker applications for operatives but we can truly achieve channel shift and move to a world where we do not need many or any call centre workers taking routine calls, planning work and communicating with customers and operatives. Instead those workers can be redeployed to focus on other tasks such as providing one to one interaction with those more vulnerable customers. The technology is there to enable this change now and with it housing organisations can look to achieve the next wave of significant efficiency gains, cost savings and customer service improvements.